The past can be hidden, but it can never truly be forgotten. I ended up reading all ninety-two pages in a single day because I was so curious to see what would happen to this protagonist next. The pacing was so strong that there wasn’t ever a good place to stop and take a break from the plot. Every scene lead to one that was even more adventurous! I simply had to know how it all ended for Mount and his friends. At times I had trouble keeping track of all of the characters. There were more of them than I would typically expect to see in a short story, and there simply wasn’t enough time to get to know all of them as well as I would have preferred to do so. While I liked all of the characters, I would have given this work a much higher rating if I’d been able to get to know a smaller number of them better. By far the most interesting scenes for me were the ones that showed what Mount knew about healing the human body. He’d never had any kind of formal medical training as far as I could tell, yet he seemed to have a lot of tricks up his sleeve when he needed to act quickly. I was absolutely fascinated by everything he knew about how bodies work. I should note that this is the second tale in a series. I haven’t read the first one yet but had absolutely no problem understanding what was going on. They can be read out of order, although I’m now quite curious to see what I missed in book one! 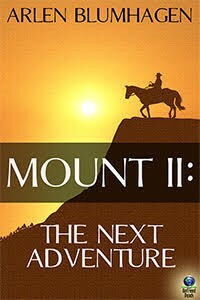 Mount II: The Next Adventure is a good choice for anyone who likes westerns.